One of the quickest and most efficient ways to drive relevant traffic to your website is PPC marketing. By using targeted online ads you can very quickly reach a large number of potential customers interested exactly in those services you are offering. In this article we are going to explain how to effectively promote your services and expand your customer base with PPC, no matter how big or small your business is. As a Growth Engineer and Digital Marketing Expert here at ManageWP, I’ve been responsible for setting up and fine tuning most or our digital marketing efforts across different channels. For a better part of the decade, I’ve been creating online campaigns with monthly budgets of up to tens of thousands of dollars. Here are a few ideas that can help you increase your online presence. Let assume that you have a WordPress business. Your website is well laid out, clearly conveying to your customers what services you are offering and the value to your customers. If you haven’t already read the previous articles about packages and tiering your offer I suggest to take a quick look as it may give you practical insight into offering your potential clients varied packages thus leaving you the room to ‘push’ your clients to higher tiers once they are satisfied with your services. You also have a few regular clients but would like to further expand the number and reach a wider audience thus increasing your customer base and improving your business. And here is where the PPC Marketing, as a quick and an easy way of reaching new clients, comes into play. Pay-Per-Click (PPC) stands as a model of internet marketing in which you pay a fee each time one of your adverts is clicked. Essentially, it’s a way of buying visits to your website, rather than attempting to “earn” those visits organically through content and SEO efforts. PPC can generate a lot of traffic very quickly. If you spend enough money & get top placements, your potential customers will see your business first. PPC advertising is fast: With some online PPC systems, such as Google AdWords, you can create ads and generate traffic within a few minutes after opening an account. PPC advertising is also flexible: Where other forms of advertising can lag weeks or months behind changing audience behavior, you can adjust most pay per click campaigns in a matter of minutes. That provides unmatched ability to adjust to ever changing market conditions and customer interests. PPC can be very cheap: PPC cost usually vary between few cents and few dollars depending on the competition for the specific words and placements. If you take into account that you pay a couple of dollars for a visitor that may end up leaving you with hundred of dollars – you can see what a bargain these ads are. You pay only when someone clicks on your ad: unlike other methods of traditional marketing, one of the main advantages of PPC marketing is that you only spend money on customers that show interest in your products or services. 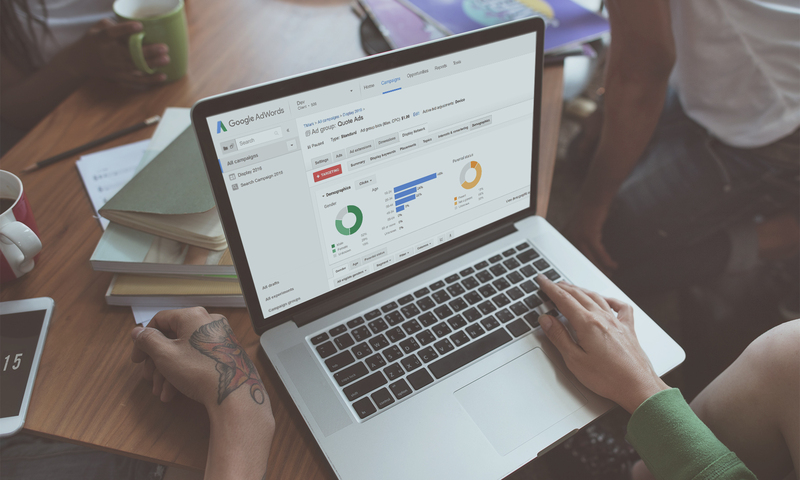 Before creating your first campaign, we recommend that you open a free Google Analytics account here (if you are not using it already) and connect it with your website to start tracking your website visits. 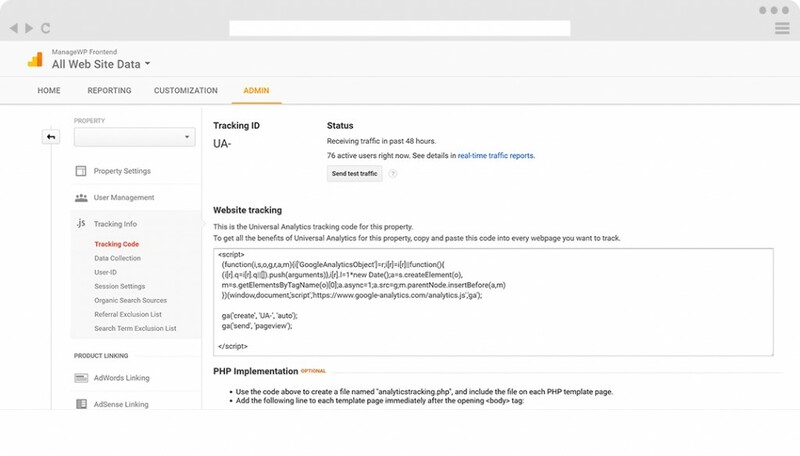 After entering a few necessary details about your website, you will receive your Google Analytics tracking code that you need to add to your website. It usually have the following format: Tracking Id – UA-XXXXXXXX-X with X representing the numbers of your tracking ID. Next step is to add this tracking code to your WordPress website. There is a number of different WordPress plugins that can help you to add this code to your website by simply pasting it to the appropriate box after adding the plugin to your website. This is a necessary step in determining the success and results of your online marketing campaigns. 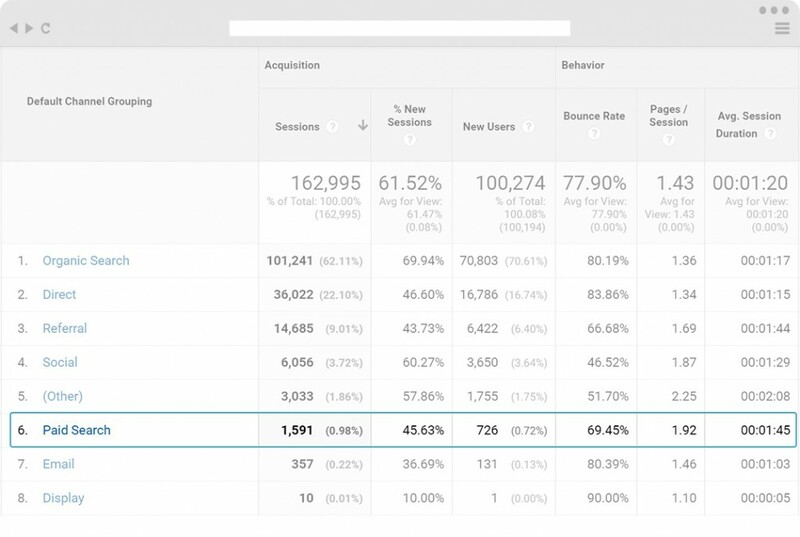 These results will show key metrics (website visits, new sessions, new users, bounce rate, etc.) that are needed for determining the success of each digital channel. Search engine advertising is one of the most popular forms of PPC Marketing. It allows advertisers to bid for an ad placement in a search engine’s sponsored links when someone searches on a keyword that is related to your business offering. As the most used Search Engine, Google is the golden standard when it comes to Search Engine Marketing. 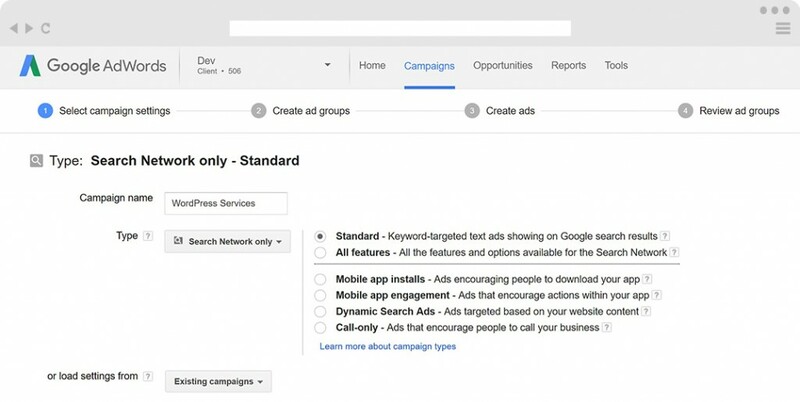 It clearly displays Adverts (placed through Google AdWords service) as well as “Organic” (non-sponsored) results for the specific keywords search. 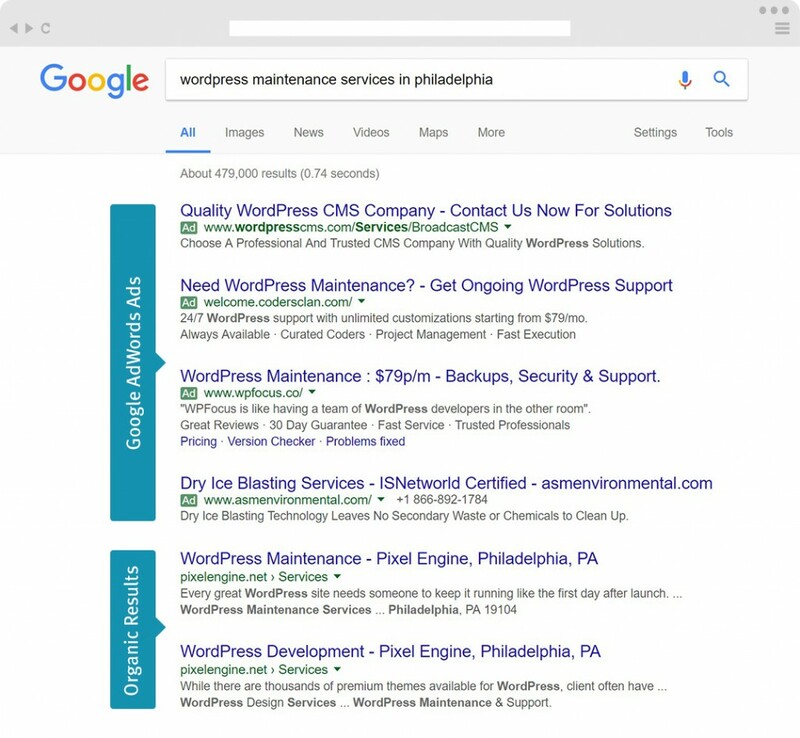 For example, if you bid on the keyword “wordpress maintenance services in philadelphia” your ad might show up in the very top spot on the Google results page. 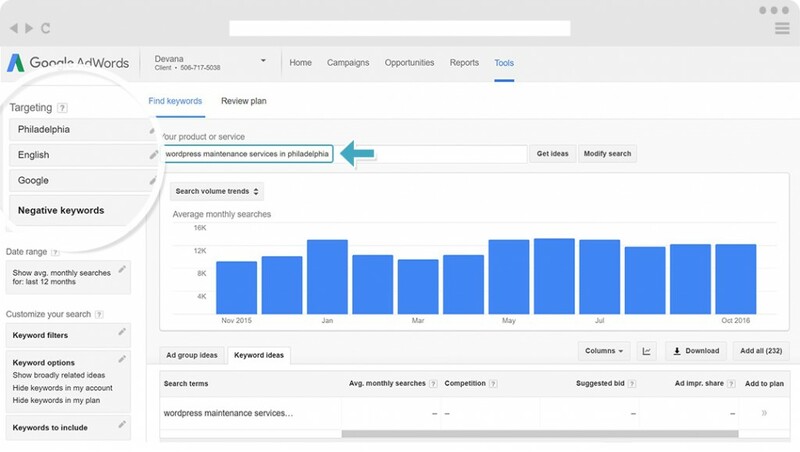 Before we get to the creation of our first AdWords campaign, we recommend taking a look at the Google AdWords Keyword tool. 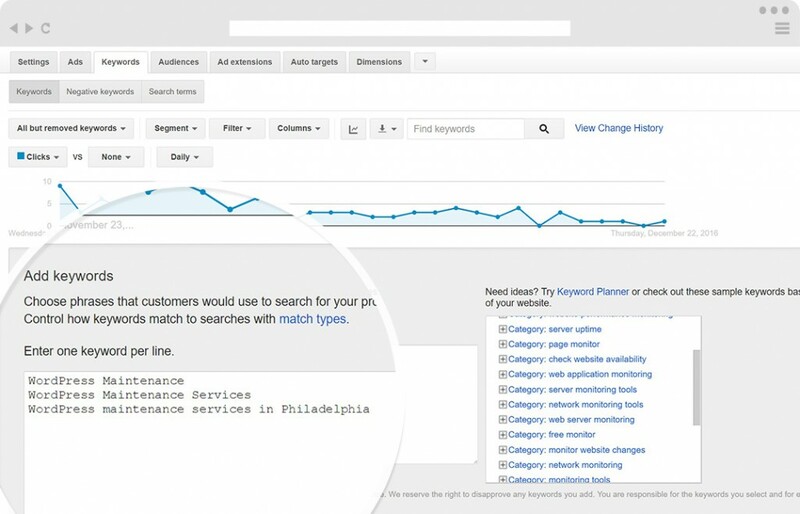 It can give you great insight into the keywords that you want to associate your ads with. 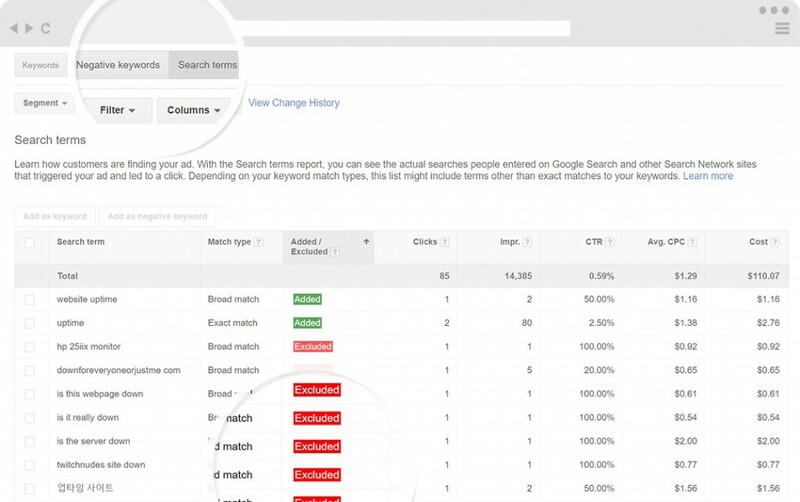 This is an essential step in the creation of a successful Search Campaign. Keyword planner can analyse your website and offer keyword suggestions that are relevant to your landing page. 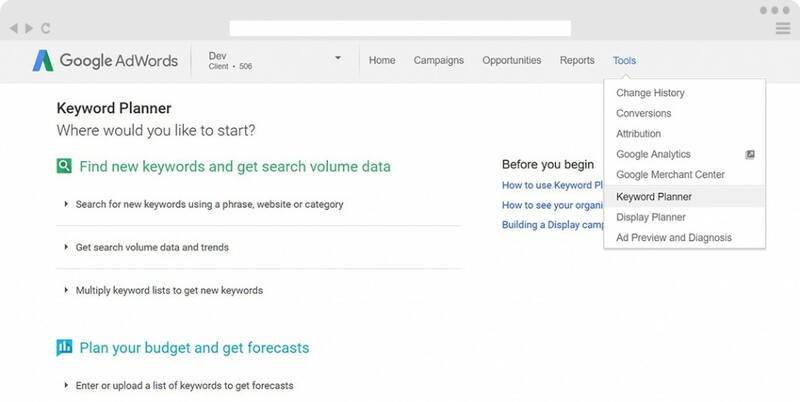 It can also show you potential new keywords, search volumes and even help you plan your budget for those keywords. And now, let’s create our first Search Campaign. Here we have to set up a few basic settings for our Campaign (Targeting Location, Audience, Budget, Groups, etc). Hint: By localizing our adverts we are making them more relevant and increase our chances of showing them to potential customers. Next step is text ad creation. 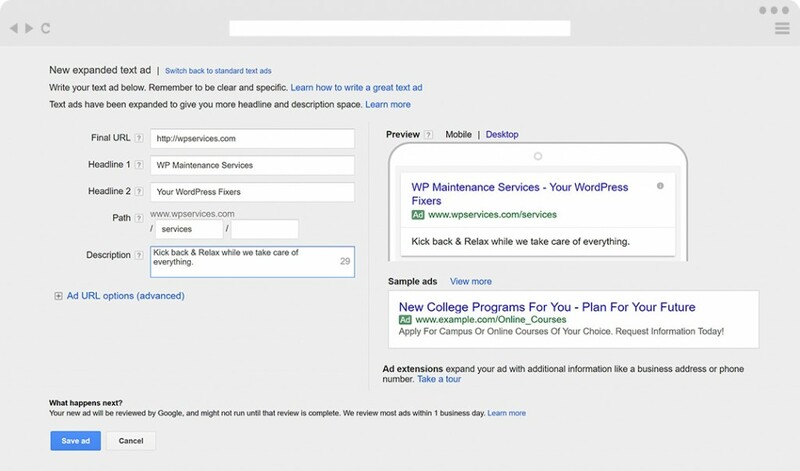 After creating our text ad, we now have the option of keywords for which our Ad will display on Google Search. It is highly recommended to use as many as possible “long-tail keywords” and phrases that are directly related to our ad. From the experience I can tell you that these phrases offer the best results and highest click-through rates (CTR). In just a few minutes, our Campaign can be published online, attracting new customers and increasing our revenue. My recommendation is to start with a minimal recommended budget and work your way up. Later, start increasing budgets for those groups/ads that show good results. After a while, you’ll have enough data to see which ads are working and which ones are not. One of the main factors for showing your ads is keyword quality and relevance. It is recommended to remove/pause keywords that show low quality score (<5). Also, you should check for what other terms are your ads showing. In case your are wasting money showing your ads for the terms that are not relevant or connected to your ads – you should Exclude those terms by adding them to the Negative keywords list. 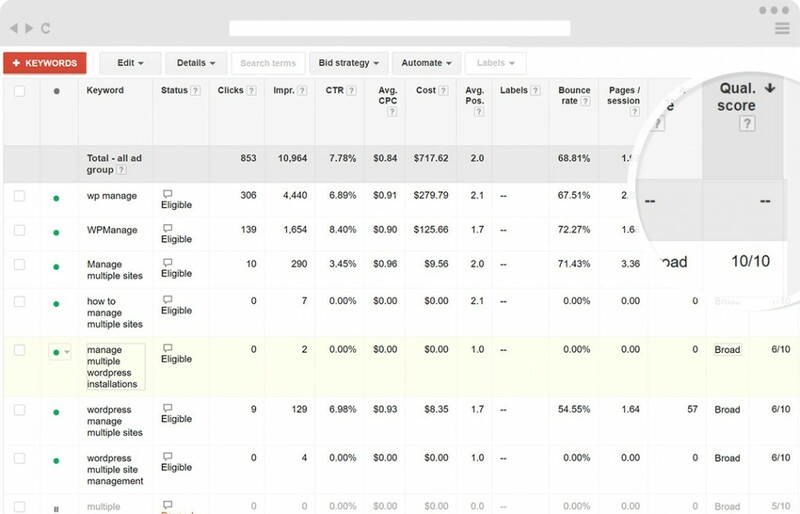 Always confirm these results by double checking them with Google Analytics you added to your website earlier. Regularly check results and adjust your campaigns accordingly. This will lead to better quality of your ads and more efficient budget spending. Another form of PPC Marketing is Display advertising. 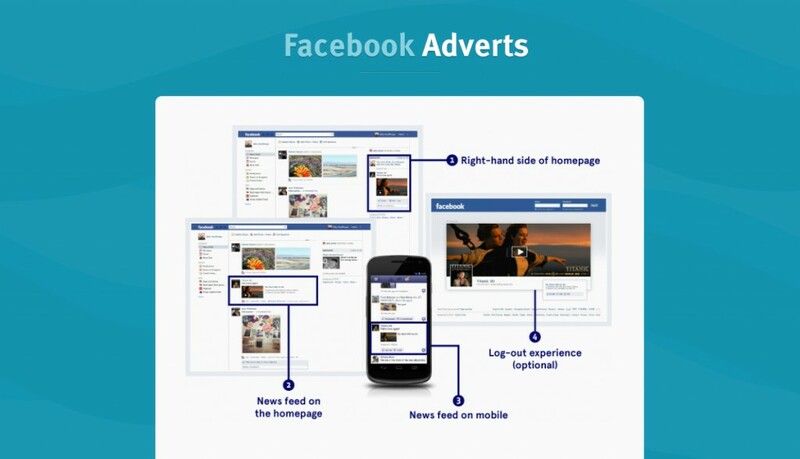 It allows you to place your adverts on different websites according to your choice of targeting. Main difference between Search and Display advertising is in a fact that with Search Advertising your adverts show only when someone searches for specific keywords while Display Advertising gives you the option of serving your ads to the audience of your choosing. As the largest Display Network, Google allows your image/video/rich media ads to be shown on over 2 million websites and mobile apps, giving you unprecedented reach and contextual and placement targeting. More and more businesses are starting to advertise on Facebook. These businesses are constantly spending more, moving their budgets away from traditional advertising channels, and increasing their social spending. The main difference between Facebook and Google Advertising is: On Facebook, you don’t care what your users are searching. On Facebook, all that matters is who your customers are. This means you’re targeting real people with real interests, hobbies, and jobs – not just keywords. If you find display advertising something that could also interest you – let us know and we will dedicate one of the following article to this particular subject. As you can see, you don’t need to be an expert or have any experience with online marketing to get started. These simple guidelines are enough to “get the ball rollin” and put you on the Google Search Results. Even if you don’t get good results from your PPC Campaigns the first time, you can always try again later by further optimizing your campaigns or, if everything else fails, hire a PPC professional to help you. If you have any questions, I will be more than happy to answer them, just drop me a comment below. 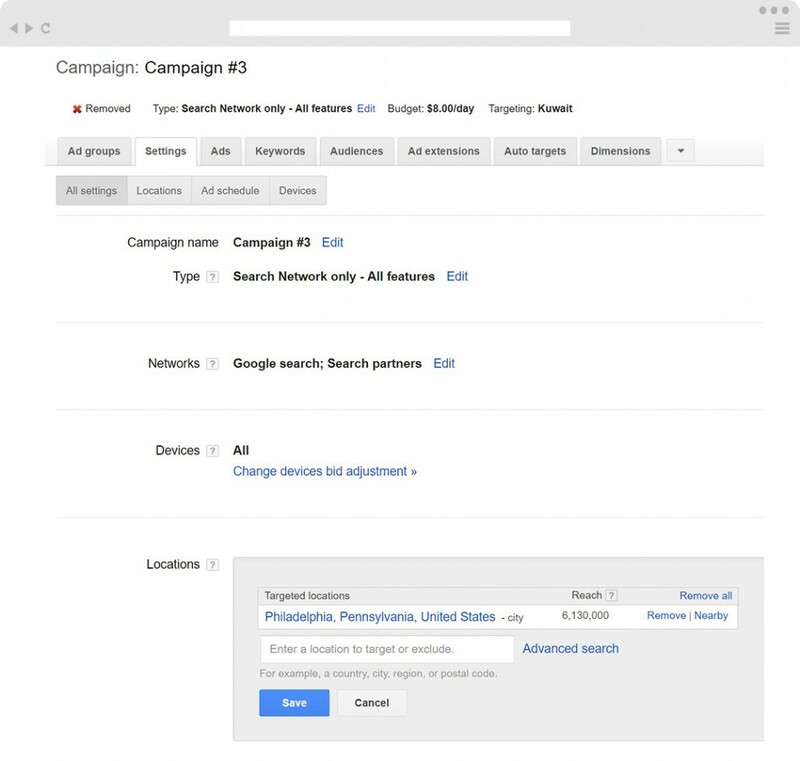 In case you have experience with PPC Marketing or already have online campaigns, there will be another article where we will dig deeper into Campaign Structuring and further optimization. This will give you further insight and some practical guidelines that will help you position your WordPress business on the No. 1 position on Google. Thanks Marko for such detailed article.